By the time we get back to Kalamazoo, we will have spent six nights at J’s parents in the Chicago suburbs. That’s a long time for the kids to be away from their toys…and more importantly, their Apple TV….and it’s a long time for six people who don’t normally live together. We’re trying to get the kids out and doing things as much as possible. I caught L sitting at the kitchen table staring at the ceiling because she actually got bored playing games on NaNa’s iPad. We found a great park not too far from where J’s parents live. Oak Lawn Memorial Park has a great play structure that is suitable for both kids. We spent about an hour there Sunday night letting the kids run around before bed. We know we’re asking a lot of the kids and they’ve been pretty good at dealing with this week. They had a couple of long days ahead of them when we took them to the park so when it was time to head home, we offered ice cream to kind of grease the wheels. We left the park and headed down Central Avenue to Premo’s Drive-In. 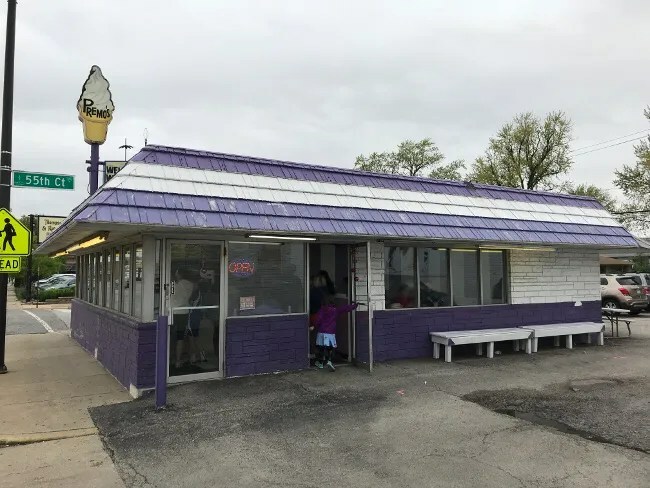 The fifty plus year old ice cream shack and grill sits on the corner of 95th Street and 55th Court in Oak Lawn’s downtown area. 95th Street is also US-12 and it’s a seven lane, high volume, high speed roadway with no street parking. Premo’s has a small lot with an entrance on the east side of the building and there is some street parking on 55th Ct. On busy days when lines are out the door, those spots are hard to come by but our visit was pretty late in the evening on a cool spring night. The building is a small shack. 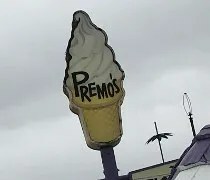 It’s kind of typical for what you think of as a seasonal ice cream place but Premo’s is no longer seasonal. They’ve been open year round for a few years now and offer a much larger menu than just ice cream. You can get the typical hamburgers and hot dogs but they also have Italian beef and sausage, tacos, and polishes to name a few. All of it…food and ice cream, is ordered at a small counter that separates the small kitchen area from the even smaller order lobby. Next to the order area is a small dine-in area. There are no tables but more of a pub height bar that goes around the outer edge of the room. There are some bar stools to sit on but that area also fills up fast. It was pretty empty when we got there but by the time we ordered, it was full so we headed outside to sit on a bench next to the building so we could eat before getting back in the car. We kept things simple with the kids. J had actually taken them to Premo’s the night before when I was at the baseball game with my “crew.” They had gotten L a Unicorn Shake which was huge and over the top. She actually still had some in the freezer so J said no to getting that again. Instead, we got both kids a small cup of vanilla custard with sprinkles. The “small” cup isn’t really that small and comes with choice of sprinkles. We did birthday sprinkles for both of them. 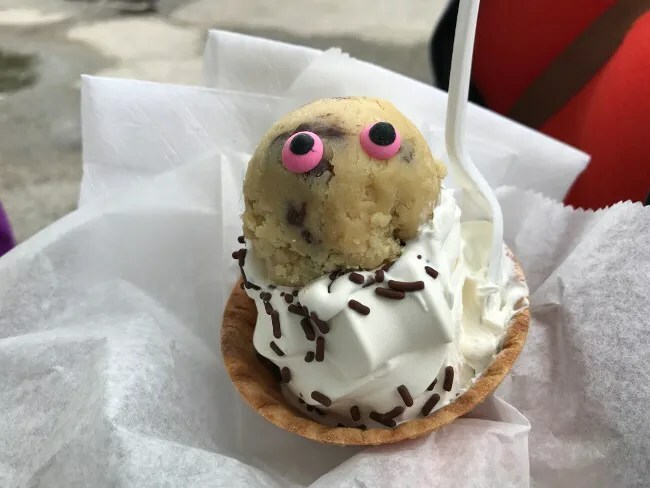 The neat little unique touch they use is putting edible eyes on to the custard. Both kids thought this was the coolest thing ever. I did boring old me and got a large Cookie Dough Glacier. 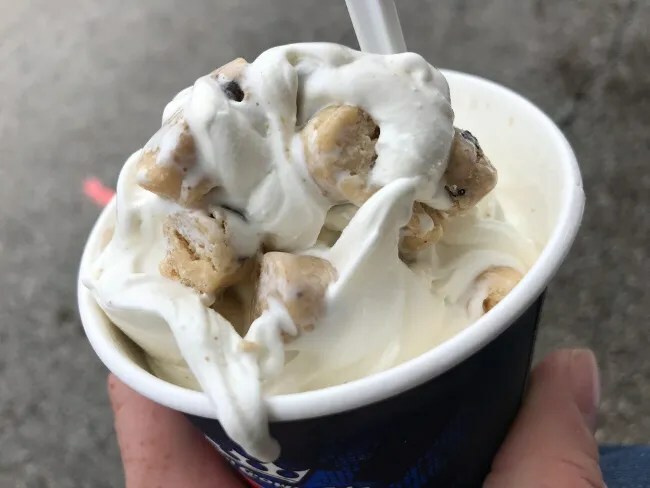 The Blizzard knock-off is made with vanilla custard and little cookie dough balls. It wasn’t mixed very well as all of the candy was near the top. The bottom half was just straight vanilla custard. Don’t get me wrong, the custard is delicious on it’s own and there was quite a bit of cookie dough in the top half of the treat. J got an Edible Cookie Dough. This thing was cool. It was a waffle cone bowl with vanilla custard and a large cookie dough ball on top. 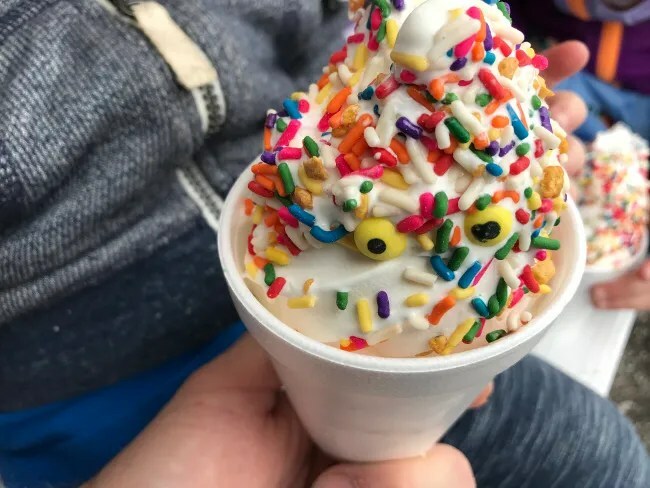 She did the chocolate sprinkles and just like the kids’ custard, it came with edible eye balls. The center piece on this is a giant ball of edible cookie dough. That alone is worth the price but it surrounded by the delicious custard and held together with a crunchy waffle cone bowl. I can’t believe that this was my first trip to Premo’s. J and I have been together for ten years and this is the first time we’ve ever thought to go here. Premo’s was a constant in her childhood. It’s right next to her high school and she would go there with her grandparents or her mom all the time to get a treat. Somehow, she has never taken me. I wish I was hungry for food when we stopped. 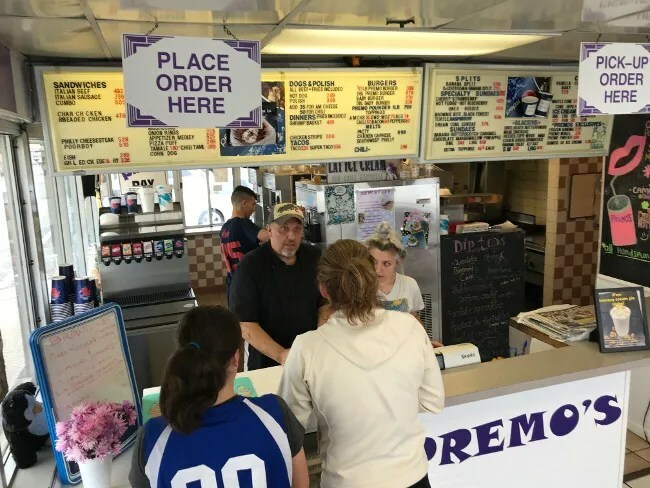 I would have tried that as well, but just as an ice cream (custard actually) joint, Premo’s Drive In is pretty great. 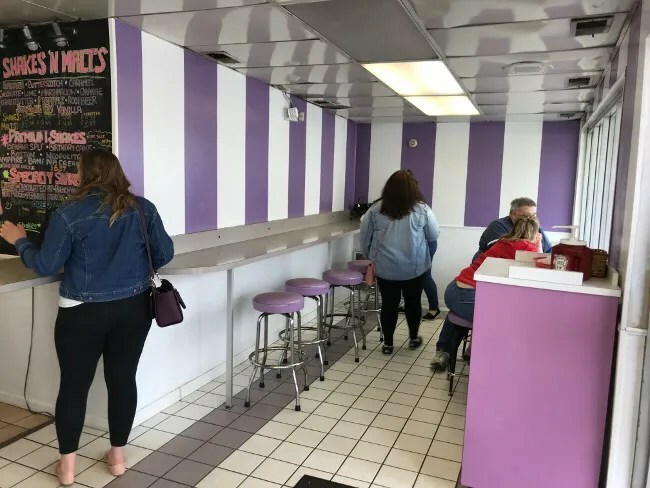 It’s a place most people in Oak Lawn grew up with and you’ll see those kids taking their kids to get some custard and take a trip down memory lane.